"You mean my mommy gets a medal, too?" Some people say that the Church needs to catch up to the world. I’ve often said that just the opposite is true: the world needs to catch up to the Church—and that’s true in particular when it comes to issues relating to family life! Here’s a case in point. What I’m about to read to you is not taken from a Catholic publication; it’s not taken from any “religious” publication. It’s from a recent issue of National Geographic magazine. It has to do with current population trends in Europe. The news, unfortunately, is not good. France began awarding medals for childbearing women of “good character” after World War I to restore its devastated population. Today again in need of more children, France has relaxed its medal rules: The mothers don’t have to be married; they don’t even have to be French. But it will take more than medals to stop the sharp population decline in most of Europe. According to the UN, Europe’s population will shrink by more than 90 million people in the next 50 years, roughly twice the number killed worldwide during World War II. For more than two decades the total fertility rate—the average number of children each woman will bear in her lifetime—has remained below the 2.1 level required to replace the population. Finally, five years ago, Europe’s population began to fall. Now demographers are abandoning their assumption that the fertility rate will return to replacement level in the near future. “It’s a monumental change,” says Joseph Chamie, director of the United Nations Population Division. And one that may not be limited to Europe. Many demographers predict that global fertility rates will follow Europe’s lead and that the world’s population could decline by the end of this century—a trend unseen since the 14th century Black Death. Among the first nations to experience the population implosion will be historically fertile Italy. With births below replacement level since 1977, Italy is projected to lose nearly a quarter of its current population by 2050. 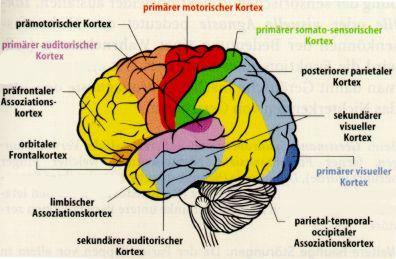 What accounts for quieter nurseries in Italy and the rest of Europe? Contraceptive use is at record levels, and women are earning more college degrees than men, leading many to seek careers first and families second—if at all. Couples who do start families are waiting longer to have their first child. Scott Elder wrote this little article for National Geographic. Mark my words, my brothers and sisters! The so-called “Right to Die” movement in this country (and in other places) will one day become the “Duty to Die” movement, and they will press very hard for mandatory euthanasia. They will say it’s necessary because there are too many old and sick people around, and not enough money available to provide for their medical needs. And given the proclivity of Americans to vote their wallets and pocketbooks—and not their consciences—it’s highly likely that these death-dealers will win the day politically! You see, the world did not listen—and is not listening—to the Church on the issue of artificial contraception, and now some nations are contracepting themselves out of existence, and opening the doors to evils like mandated euthanasia! When it comes to issues which relate to family life, we need to submit ourselves to the wisdom of the Church—because the Church speaks with the voice of Jesus Christ, and Jesus is the ultimate authority on the family! After all, he’s been part of one for much longer than any of us have. And here I’m not talking about the Holy Family, I’m talking about the Blessed Trinity! The Trinity, in a very real sense, is the original Family! Consequently, the love between the 3 Persons of the Trinity is to be the inspiration and the model for the love we show to one another in our earthly families. This means that before he came to this earth and was born of the Virgin Mary, the Son of God lived in a bond of perfect familial love with the Father and the Holy Spirit. Of course, when he was born into an earthly family on Christmas Day, he brought that love with him. It’s the love that made him selfless, and patient, and forgiving—and obedient to his parents (as St. Luke tells us he was in today’s Gospel text). Please hear that, young people! They really weren’t too happy about that answer—because obedience isn’t always fun. But it’s essential for peace in a family! Just think of how much unhappiness comes into our families because of disobedience. I was at my sister’s the other night in Barrington, and my nephew Nicholas—who just turned thirteen—had a typical teenage fit when his parents asked him to do something he didn’t want to do. And for a while, there was no peace in the house. Jesus, through his Church, gives us the blueprint for peaceful, strong, healthy families—which is actually the blueprint for a peaceful, strong, healthy society, since (as the Catechism tells us), the family is “the original cell of social life.” As the family goes, so the culture goes. For example, the contraceptive mentality—which is currently present in many individual families—is now having a devastating effect on societies and cultures all over the world. That was one of the clear messages contained in the National Geographic article I read to you a few moments ago. Those are some of the virtues necessary for peace and harmony in any setting, but especially in the family! Now, in case you haven’t figured it out yet, those virtues are much easier to talk about than they are to live out. Being compassionate, humble, forgiving, etc. requires a great deal of personal sacrifice and effort. But the good news is that we don’t have to do it alone. Jesus Christ is there to help us—especially through the sacraments—to live these necessary virtues. Of course, we need to be open to this grace when it comes to us, and we need to freely cooperate with it. On this feast of the Holy Family, it’s important for us to remember that Jesus, Mary and Joseph did not have an easy life together. They were poor; they were refugees for a time; they were even pursued by a lunatic king who would have killed them all if he had had the chance. But even though they faced many storms on the outside, because of the virtues they possessed on the inside they lived in peace with one another—and that made them a “holy” family. In the midst of the storms our families face, we can have that same peace, if we follow the wisdom of the Church and not the false wisdom of the world. Lord Jesus, help us to do that today and every day. Amen. Now, on the one hand, there’s nothing at all modern about a crèche display like the one we have here in our church this morning. That should be obvious. We’re looking at a scene from 2,000 years ago, a snapshot from a cave or stable located in a far distant part of the world, in a culture that was certainly very primitive (at least by our standards). And yet, on a deeper level, it’s really very modern. In fact, I would say that what you are looking at in this crèche scene (or in any crèche display) is actually one part of a two-dimensional picture of the modern world. The other dimension of the picture is its background—which is present, although it’s not seen immediately with the naked eye. The Christmas crèche, plus its background, equals the world in which we live: modern, technological, sophisticated—the most advanced civilization in human history. Which brings us to what I would call the crucial question of Christmas for each of us: Which part of the picture am I in at the present time? Am I somewhere in this scene, or am I in the background? Fr. Ray, this sounds awfully confusing! Not at all! It’s really quite easy to understand. Think about the original Christmas event. Who were the people in the background when that glorious moment arrived, and the Son of God took flesh and was born of the Virgin Mary? Well, there were actually many people in that location, but the most noteworthy among them (at least according to the Bible) were the innkeepers of Bethlehem, and King Herod. Herod, on the other hand, rejected our Lord out of fear. He perceived Jesus to be a direct threat to his power and security. Imagine, a big, tough king threatened by a little baby just out of the womb! Incredible—but true! And yet, I ask you this morning: Aren’t these the very same reasons why Jesus Christ is rejected today, in the year 2003? Aren’t these the very same reasons why many people—even some professed Catholics—reject the authoritative teaching of the Church on matters of faith and morals? And then there are the modern-day Herods who want to eliminate all Christian symbols and influences from our culture. 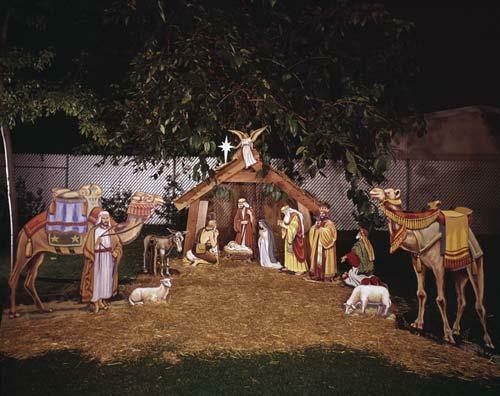 Thus every year (as we all know) there are numerous lawsuits filed in this country concerning the display of crèches on public property, and the telling of the true Christmas story in public schools, and the singing of Christmas carols in government buildings. But enough of those in the background. When we stop and look at the crèche itself, we see something very different—thank God! First of all, we see two people—Joseph and Mary—who were also inconvenienced, especially in the days and weeks surrounding our Lord’s birth. In fact, they were more inconvenienced than all the innkeepers of Bethlehem put together! And yet, they didn’t reject the Son of God. Quite oppositely, they responded to the inconveniences they faced by making all the necessary sacrifices, and by welcoming the child Jesus into the world with love and gratitude. And so they are role models for many. For example, they’re role models for all women who find themselves in difficult, inconvenient pregnancies; they’re role models for all parents who are struggling to make ends meet; they’re role models for all of us who are challenged to love others and be patient with others who inconvenience us in various ways. The shepherds represent those many simple believers throughout the world who love God and aren’t ashamed of their faith—like the nice, old, Italian lady from our parish (one of my communion calls)—who spent two weeks decorating her house for Christmas, and who doesn’t hesitate to tell people that Jesus helped her do it. A simple woman with a deep, sincere faith. The shepherds also represent those who sometimes do not understand the ways of God, but who still believe, who still cling to their faith (like the believing couple from our parish who lost their 2 year-old son a few weeks ago). Remember, the shepherds did not fully understand the revelation the angel gave to them that holy night as they were tending their flocks, but they still believed it. The magi—the wise men—represent the learned of our world who know that faith and reason are not mutually exclusive categories; they represent those who understand that religion and science are not enemies (as our post-modern society would have us believe). In other words, they represent the truly enlightened: those whose earthly knowledge leads them, not away from God, but to a deeper reverence for God—and a deeper respect for his eternal law. Unfortunately, there are not enough of these wise men and women out there right now, but we can take heart in the fact that their number has grown significantly in recent years, much to the chagrin of the atheists and materialists. So there you have it: The Thoroughly Modern Manger. It’s really as up-to-date as today’s newspaper. Are you in it, or are you in the background? May the Lord help each of us to give an honest answer to that question this morning. Of course, the good news is: if you find yourself in the background at the present moment, there is still time to get into the crèche itself. In fact, I think that’s the reason the baby Jesus has his arms outstretched in almost every manger scene. It’s a welcoming sign to the “innkeepers” and even the “Herods” of the modern world. He’s inviting them in; he’s inviting them to repent; he’s inviting them home. Let us pray that many of them will accept his invitation this Christmas. It’s Time to Reprogram the Computer! It was Thanksgiving Day, and I panicked. For a split second, I was seized with a horrible sense of fear—as if I had just fallen off a cliff and was plummeting to the earth at warp speed! But then I took a deep breath, and composed myself. And at that instant, a light went on and I suddenly saw things clearly. Glory be to God, why was I panicking about my Christmas shopping when Christmas was a month away? It’s because the world had programmed me to panic, that’s why! The fact is, since late October I had been seeing Christmas displays in department stores and holiday advertisements on TV; since early November I had been hearing Christmas songs on the radio! Since early November! Subconsciously, it seemed like Christmas was right around the corner, even though it wasn’t. My mental computer desperately needed to be reprogrammed. And I dare say that at this point in the Advent season, your mental computer probably has the same need. You see it’s very easy for all of us to be affected—especially in December—by the commercialism, the materialism, and the secularism of our contemporary American culture. Which explains in part why so many people are miserable at this time of year! They have allowed the world to “program” them such that they’re focused almost exclusively on themselves and on “externals”: gifts, parties, decorations, cooking, shopping. And that ultimately leaves them depressed and empty (especially if they’re trying to cope with a personal trial or suffering at the same time!). Then this season—which should be filled with hope and joy—becomes a terrible burden! So obviously we need to be aware of the many harmful ideas that the world is trying to put into our “computer” during these weeks before Christmas. We need to be aware of them so that we can “delete” them before they cause any permanent damage. Let me focus on 3 of these evil, erroneous ideas during this homily—3 of the most common, and the most dangerous. #1) Jesus doesn’t matter. In fact, he might be offensive to some people, so we should avoid even mentioning his name in public at this time of year. Have you heard that message? It’s literally all over the place. It’s in every town where it’s against the law to have a crèche display. It’s in those public schools where you can sing Jewish songs and Islamic songs but not Christmas carols. It’s in the Meriden, Connecticut public library. Officials there refused recently to allow 5 paintings of Jesus to be displayed in their facility, saying they were “inappropriate” and “offensive.” One of those paintings was of our Lord’s birth. Of course, this message that Jesus doesn’t matter also comes to us in far more subtle ways. Believe it or not, it even comes to us on Christmas wrapping paper! Do you know, my brothers and sisters, how difficult it is to find wrapping paper at this time of year with anything religious on it? It’s almost impossible! You can find wrapping paper with wreaths on it, and candy canes on it, and big, fat Santa Clauses all over it—but it’s very, very, very hard to find Christmas wrapping paper with an image of Jesus Christ on it! I know because I’ve tried! I try every year! And it’s his birthday! You won’t even find the words “Merry Christmas” on most Christmas wrapping paper. “Seasons Greetings” is about the best you can hope for. Now tell me that makes sense! The world wants us to forget about Jesus. Which brings us to erroneous idea #2: Advent isn’t important. This, incidentally, was the lie that was responsible for my little “panic episode” on Thanksgiving Day. You see, for the world, there is no Advent! The world goes right into the “Christmas mode.” It used to start in late November; now it starts sometime in late October. I never remember hearing Christmas carols on the radio before Thanksgiving Day. This year I was hearing them at the beginning of November. You know that old expression, “Christmas in July”? At the rate we’re going, there will come a day when that will no longer be a joke! Advent is a time of preparation—and it’s given to us by the Church because we need it! 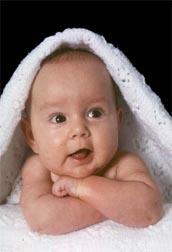 To really appreciate the Lord’s birth, we need to spend some time pondering its meaning (at least 4 weeks! ): Why did he come? What did that event mean for humanity? What does that event mean for me, now, in the year 2003? Notice—in today’s Gospel text, we hear once again about John the Baptist. John was sent for preparation. Through the message of John, the Lord was getting his people ready to receive their Savior. As John himself said in this text from Luke 3, he was baptizing with water, to prepare the people for the one who would soon baptize them in the Holy Spirit. If you think about it, John’s ministry was a lot like the season of Advent. And, of course, when he preached, John called the people to repentance! He challenged them to make concrete, positive changes in their lives. Tax collectors and soldiers were challenged in today’s Gospel. John the Baptist knew that if men and women truly repented of their sins, they would be more open to Jesus and his message. They would be better prepared to receive their Messiah. This is why the Church encourages us to go to Confession during the season of Advent: so that we will be more open to the blessings of Christmas and the Christmas season. Which brings us to erroneous idea #3: Joy comes from the outside. Get together with enough friends, have enough drinks, eat enough Christmas cookies, get enough gifts, and you’ll be happy. Try telling that to the couple in our parish whose 2 year-old son died the other day; try telling that to the man who just lost his job; try telling that to anyone who’s currently going through a difficult time in their personal life. If joy comes from the outside (as the world would have us believe), then people like this have no hope, because their external circumstances are not joyful at the present moment. True joy comes from within: it comes from knowing Jesus Christ and the truth of his Gospel. If I really believe everything—and I mean EVERYTHING— that the Church teaches about Jesus and his message, then I will be able to “Rejoice always” (as St. Paul tells me to do in today’s second reading from Philippians 4), even if I’m going through a difficult time in my life. I won’t rejoice in my present circumstances (because my circumstances aren’t good), but I will be able to rejoice in the hope God gives me in spite of my present circumstances. And so, on this 3rd Sunday of Advent, the Lord asks us to take a good look inside our mental “hard drives” to see if these—or any other false ideas of the world—have somehow wormed their way in. And if they have, let’s resolve this morning to get our mental computers re-programmed before December 25th arrives. Believe it or not, that will be the best present that we can possibly give ourselves for Christmas. 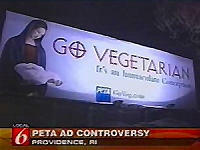 The PETA Billboard And The Real Immaculate Conception! I’m sure most of you have heard about the PETA billboard that was recently put up off Route 195 in Providence. PETA stands for People for the Ethical Treatment of Animals. The billboard has a picture of the Blessed Mother on it, holding a dead chicken in her arms (instead of the Christ Child); and off to the side are written the words: Go Vegetarian—It’s an Immaculate Conception. I was pleased to see that some non-Catholics and even some non-Christians were upset by this perverse portrayal of our Lady. The Rev. 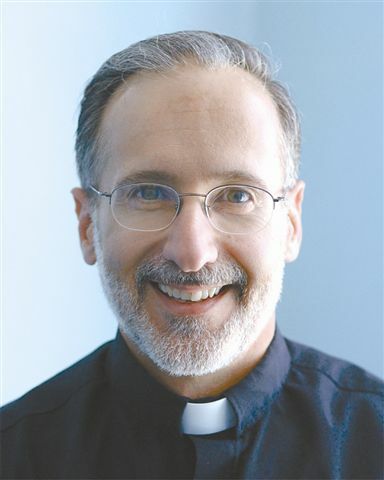 John Holt, a Protestant minister and the head of the R.I. Council of Churches, was quoted in the Providence Journal as saying, "I just find [it] appalling. [It’s] absolutely insulting to any Christian." Of course, this is merely one more example of how the sacred is being profaned and dragged through the mud in contemporary American culture. Remember the crucifix suspended in urine that was passed off as art several years ago? Or how about the portrait of the Blessed Mother surrounded by elephant dung and pornographic images that was in the Brooklyn Museum of Art even more recently? Of course, to the ACLU and others of that ilk, it’s just “free speech.” Slander Jesus or is Mother, and they say you’re protected by the Constitution. Say something nice about Jesus or his Mother, and you risk getting hauled into court. Welcome to 21st century America! But here’s something that the PETA people (and the ACLU gang) need to understand: When you demean our Blessed Mother, you ultimately demean yourself (and every other member of the human race)! Because when you attack the greatest member of any group, you implicitly attack all the other members of lesser status. The Immaculate Conception is all about Mary’s greatness as a person and as a disciple. Much to the chagrin of the people at PETA, this event has nothing to do with vegetarianism being a good idea. The Immaculate Conception means that Mary, from the first moment of her conception in the womb of her mother, Ann, was preserved from original sin by a special grace from God, through the merits of her divine Son, Jesus Christ. And at every moment of her life thereafter, she said Yes to the Lord and his will. The Annunciation (which we heard recounted for us in today’s Gospel), was but one example of her faithfulness. What she did there, she did always and everywhere. Now that’s hard for us to imagine and understand, since we all disobey God everyday—but it’s true nonetheless! And this is one reason why we call Mary, “our hope.” If she can say Yes to God and remain faithful to him in good times and in bad, then so can we! She was a human person, made of the same “stuff” that we are. On that note, last week a little two year old boy from our parish died suddenly. It’s an event that every parent fears. I encouraged little Travis’ parents to look to Mary for comfort, for prayers, and for support in the future—because she understands! She’s a human person who understands. She knows what it is to suffer this type of devastation. She knows what it is to lose a child in a shocking way; she knows what it is to feel the void and emptiness deep within. But in spite of her loss, Mary never sinned; in spite of the devastation, she always remained faithful to her God. That’s not easy. (Just ask any parent who’s lost a child.) But if Mary can do it by the Lord’s grace, then so can we. The people at PETA want to help build a better world, and that’s a noble desire. But they’re going about it in the wrong way. If you want to renew a culture, if you want to make the world a better place, you need to begin by extolling Mary, not by denigrating her! She’s the fairest of our race; she’s the greatest disciple; she’s the woman who shows us what we can be if we allow God to work in our lives. When we extol Mary, we automatically lift ourselves and all humanity up! When we extol Mary, we also point our young people to the perfect heroine—the perfect role model. And, as we all know, our young people today desperately need good role models of faith and virtue. Holy Mary, Mother of God, conceived without original sin, pray for us this day and every day, that we might be more like you. Amen.